CAIRO (Reuters) - Yemeni President Abd Rabbu Mansour Hadi on Monday appointed a former senior figure in the country's army as deputy supreme commander of the armed forces, state media reported. General Ali Mohsen al-Ahmar was a politically powerful army general who split violently with former Yemeni president Ali Abdullah Saleh in 2011 during the Arab Spring protests that eventually ousted Saleh. Since then, Yemen has descended into a civil war that pits a Gulf Arab coalition led by Saudi Arabia and Yemeni forces loyal to Hadi against the Houthi militia, backed by Iran, and forces allied to Saleh. 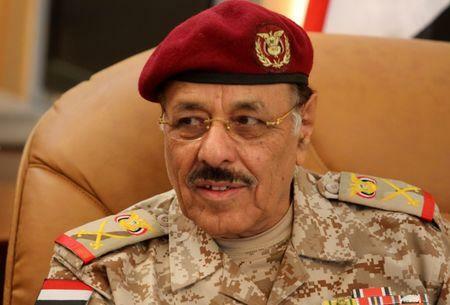 In an army shakeup in 2013, Hadi appointed Ahmar, a Sunni Islamist-leaning general and commander of the First Armoured Division, as a presidential adviser for military affairs. Forces loyal to Ahmar tried to stop the Houthi from taking Yemen's capital, Sanaa, in September 2014. They failed, and Ahmar later fled to Saudi Arabia. It was not immediately clear how Mohsen's appointment would affect the balance of fighting on the ground.